“Records go out the window for the Island Cup,” Coach Don Herman said. “We’ve had a 10-game preseason, and now we have a one-game season." The annual Island Cup football rivalry between Martha’s Vineyard and Nantucket is set to return this weekend, a year after it was cancelled for only the second time in its long history, dating back to 1953. This year’s matchup takes place Saturday, Nov. 17 beginning at 1 p.m. at Nantucket High School. Last fall, injuries and disciplinary issues plagued the Vineyarders throughout the season, forcing first-year head coach Ryan Kent to call off the game. The only other time the storied matchup was canceled was in 2009 when Nantucket declined to schedule the game because of financial issues. 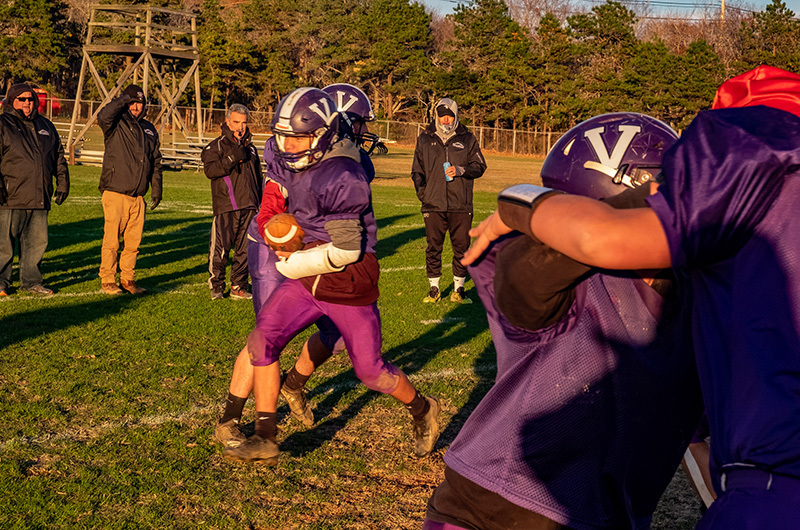 For Vineyard coach Donald Herman, who returned to the helm after a two-year retirement, this year’s matchup is a chance to reclaim the coveted Island Cup trophy that’s resided on Nantucket the past two years. The Whalers won the inaugural game on their home field 33-20 after an injury-filled game that included a twisted ankle, dislocated thumb and a broken nose. The Whalers dominated the rivalry until the early 2000s under Coach Vito Capizzo, after which the Vineyarders held the trophy for a record 12 straight years under Coach Herman’s leadership. The streak ended in 2016, the year after Mr. Herman retired, with a 42-0 blowout loss at home, the most lopsided game in Island Cup history. The Vineyarders head into the Island Cup this year coming off a disappointing 2-8 regular season where the young team struggled to gain momentum but showed signs of future success in several close games. The Whalers finished the regular season 6-2, reaching the Division 7 South Sectional semifinals where they lost to Abington High School. During a windy and muddy practice Tuesday afternoon, Mr. Herman stood behind his defense with his arms crossed and a whistle in his mouth. He blew it and a running back holding the football dashed to the side of the field trying to avoid a defensive back charging at him. The defensive back caught the running back just before he turned the corner. Mr. Herman blew the whistle again and the drill reset. He looked down at page one of his practice schedule packet and shook his head. Mr. Herman said it was tough to watch from the sidelines when Nantucket ended his Island Cup winning streak in 2016. A new drill began and Mr. Herman and the team crossed over to the other side of the field. A black sticker adorns the back of each helmet with the initials VC in white. Mr. Herman said this is to honor Coach Vito Capizzo, who died earlier this year, making Saturday’s game the first without Mr. Capizzo looking on from either the sidelines or the stands. Mr. Capizzo led the Whalers for 45 years and to nearly 300 career wins before he retired in 2009. “He was a good competitor and good friend,” said Mr. Herman. First-year Nantucket coach Joseph Perry agreed that Mr. Capizzo’s spirit will be part of the game Saturday. Mr. Perry said he’s glad the rivalry is back on and though he and Mr. Herman call each other friends, he plans on Nantucket keeping the Cup indefinitely. This year’s Island Cup also marks the last year the game will be played in November at the end of the season. Next fall the Vineyarders will move from the Eastern Athletic Conference back into the nine-team Cape and Islands League that includes Nantucket. The game will be played earlier in the season per league requirements, making it a matter of more than just pride for the two teams, since winning the game could also mean winning the league. “That adds to the flavor,” said Mr. Herman. Last Friday at practice, Mr. Herman resumed a tradition he started in 1991. The senior players gathered in the end zone and then every coach and every player took turns shaking their hands, and congratulating them on their high school football careers. Mr. Herman then handed a letter to the seniors and had them open it away from the rest of the team to read it. Mr. Herman said that regardless of all the history and circumstances surrounding this year’s Cup, on the field Saturday it’s just going to be about football and the fight for another yard on hostile territory. Transportation to Nantucket is available via a Steamship Authority ferry chartered by the Martha’s Vineyard Touchdown Club, the Island’s football booster organization. The ferry will leave Vineyard Haven on Saturday morning at 7:30 a.m. and return from Nantucket at 4:30 p.m. Ferry tickets can be purchased at the MVRHS front desk or at Northline Shell. Adult round-trip passenger tickets are $30. Tickets for students and seniors are $20. Car reservations are sold out.